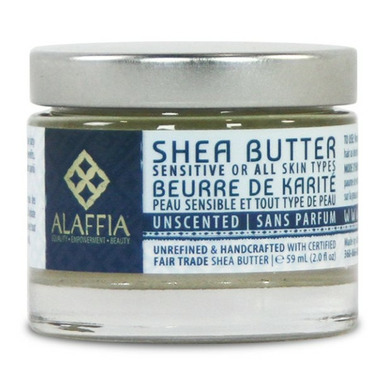 This ethically traded unrefined shea butter is made at Alaffia's cooperative in Togo, West Afria. It moisturizes and protects, leaving skin soft and smooth. This unscented product is suitable for all skin types, including sensitive. I don't love the smell (almost nutty), however the product itself is very nice and moisturizing. Loooooove love love this shea butter!! It melts in my hands which is different from other I've tried that was hard to melt. I gave it a 4/5 because of how small the container is.